Vivo X6 is expected to see the launch on November 30th with a decent set of specifications on board. Not too long ago, the handset made an appearance on TENAA, a Chinese certification body, and now we have some more details about the upcoming beast from Vivo. 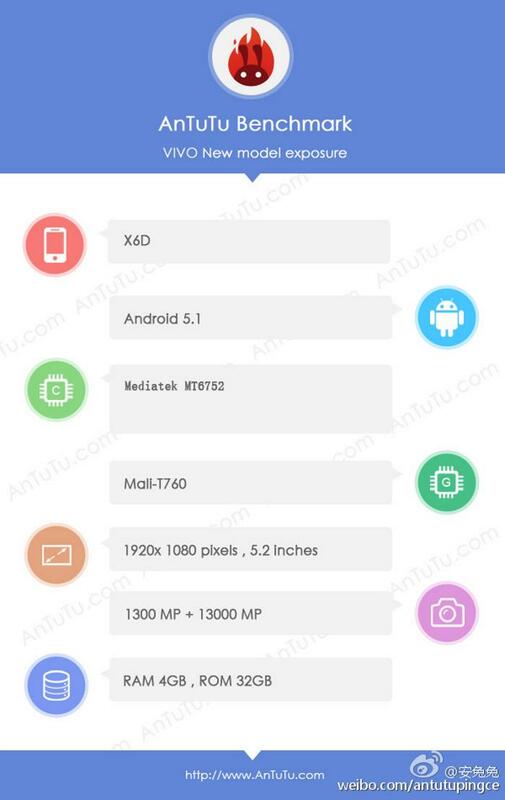 The Vivo X6 was spotted on AnTuTu benchmarking website, revealing the complete list of specifications the handset is expected to come with. The handset appears to feature a 5.2-inch display with a resolution of 1920 by 1080 pixels, which is quite surprising as most high-end devices these days are equipped with a display boasting 2K resolution. The device is powered by an octa-core MediaTek MT6752 SoC and a Mali-T760 MP2. Other features include a 13MP front and back camera for photos, 4GB of RAM and 32GB of internal storage. The device scored 46,585 on AnTuTu benchmark, which isn’t too extraordinary but good enough considering the specifications it comes with. There’s a possibility that we may get to see different variants of the handset so let’s just wait and see what the Chinese company has is store for us — the launch is almost two weeks away, as soon as we get some more information on the device we will update you.